/uploads/1/5/6/4/1564155/baab_cv_2016.pdfI am a biological anthropologist who studies human evolution. My main research interests include the study of hominin (humans and the extinct relatives) taxonomy and phylogeny using cranial morphology, the application of geometric morphometrics to study skeletal variation and functional morphology, and the evolutionary history of Plio-Pleistocene Homo. I am currently an Assistant Professor in the Department of Anatomy at Midwestern University in Glendale, AZ. Aftern earning my Ph.D. in anthropology at the City University of New York (part of the New York Consortium in Evolutionary Primatology) in 2007, I was a Research Instructor in the Department of Anatomical Sciences at Stony Brook University and then an Assistant Professor in the Department of Anthropology at the same university. Click here for CV (updated 04/2016). I have a longstanding interest in the widespread and long-lived human ancestor known as Homo erectus. The oldest fossil humans outside of African (at Dmanisi, Georgia) are attributed to H. erectus and members of this species are found as far south as South Africa and as far east as China and Indonesia. My work focuses on quantifying the shape of the skull in members of this group in order to better understand whether this is in fact a single species (versus multiple species), the relationships among populations, and the factors that have influenced differences in cranial shape across this species range. I have also led a series of studies of the famous "Hobbits" of Flores, Indonesia.This work compared the shape of the LB1 skull to a large comparative sample of modern humans (including small bodied populations), fossil hominins, and apes. These analyses explicitly consider the scaling relationship between size and shape. More recent analyses have re-evaluated claims that these fossils are actually small-bodied modern humans, with the most complete individual (LB1) suffering from a pathological condition. My results consistently support the hypothesis that Homo floresiensis is a late-surviving species whose strongest affinities lie with early Homo. Members of H. erectus and other extinct species of the genus Homo differ from other species in the expression of "robust" features of their skull, including thick cranial bones and various tori and crests on the external surface of the skull. These traits have featured prominently in hypotheses about H. erectus taxonomy and phylogeny, but the underlying basis of these traits is poorly understood. I am currently CT scanning associated skeletal elements from a large sample of modern human populations to test one hypothesis, termed the systemic cortical bone robusticity hypothesis. Put simply, physical exercise leads to heightened expression of certain hormones that may lead to a systemic response of increased cortical bone deposition throughout the body. With Dr. William Jungers (Stony Brook University), Dr. James Rohlf (Stony Brook University) and Dr. Jonathan Perry (Midwestern University), I am examining skull form and function in extant and subfossil lemurs from Madagascar using a combination of traditional linear and 3D geometric morphometrics. 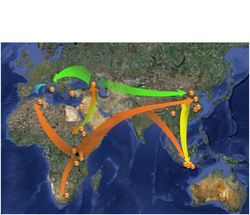 Map of possible Homo erectus sites and hypothetical directions of migration and/or gene flow. LB1 (Homo floresiensis) with 3D landmarks. Photo of LB1 copyright Peter Brown. Robust cranial traits illustrated on modern human skull. Principal components analysis of cranial shape in lemurs. Baab, K.L. (2016) The role of neurocranial shape in defining the boundaries of an expanded Homo erectus hypodigm. Journal of Human Evolution. 92: 1-21. Baab, K.L. (2016) The place of Homo floresiensis in human evolution. Journal of Anthropological Sciences. 94: Early View. Link to pdf. Baab, K.L. (2014) Phylogenetic, ecological, and allometric correlates of cranial shape in Malagasy lemuriforms. Evolution. 68: 1450–1468. Baab, K.L., McNulty, K.P., and Harvati, K. 2013. Homo floresiensis contextualized: A geometric morphometric comparative analysis of fossil and pathological human samples. PLoS ONE. 8(7): e69119. Baab, K.L., McNulty, K.P., and Rohlf, F.J. 2012. The shape of human evolution: A geometric morphometrics perspective. Evolutionary Anthropology. 21: 151-165. McNulty, K.P. and Baab, K.L. 2010. Keeping asymmetry in perspective: A reply to Eckhardt and Henneberg. American Journal of Physical Anthropology. 143: 337-339. Baab, K.L., Freidline, S.E., Wang, S.L., and Hanson, T. 2010. Relationship of cranial robusticity to cranial form, geography and climate in Homo sapiens. American Journal of Physical Anthropology. 141: 97-115. Baab, K.L. and McNulty, K.P. 2009. Size, shape, and asymmetry in fossil hominins: The status of the LB1 cranium based on 3D morphometric analyses. Journal of Human Evolution. 57: 608-622. Baab, K.L. 2008. The taxonomic implications of cranial shape variation in Homo erectus. Journal of Human Evolution. 54: 827-847. Baab, K.L. 2008. A re-evaluation of the taxonomic affinities of the early Homo cranium KNM-ER 42700. Journal of Human Evolution. 55: 741-746. Baab, K.L. 2012. Homo floresiensis: Making sense of the small-bodied hominin fossils from Flores. Nature Education Knowledge 3(9): 4. Link to website. Jungers, W. and Baab, K. 2010. The geometry of hobbits: Homo floresiensis and human evolution. Significance. 6: 159-194. Interviewed for Italian science website Pikaia. Link to interview (in Italian). Featured in the New York Times. Link to article. Author spotlight blog post on PLoS ONE. Link to blog. Featured in Le Monde (Paris). Link to article. Featured in Newsday (Long Island). Download article. Featured on Planeterde.de. Link to article. Featured on ATSE Wonder of Science. Link to article. Featured in Zero Hora (Brazil). Link to article. The American Museum of Natural History did a Human Bulletin piece that featured our research and a video is currently featured in the Hall of Human Origins (through Feb. 6, 2009). Navigate directly to the AMNH webpage. Several on-line news outlets also covered this story, including USA Today, National Geographic, the Guardian (UK), and ScienceDaily. Elizabeth Culotta also mentions the Significance piece in the Science "Origins" blog.